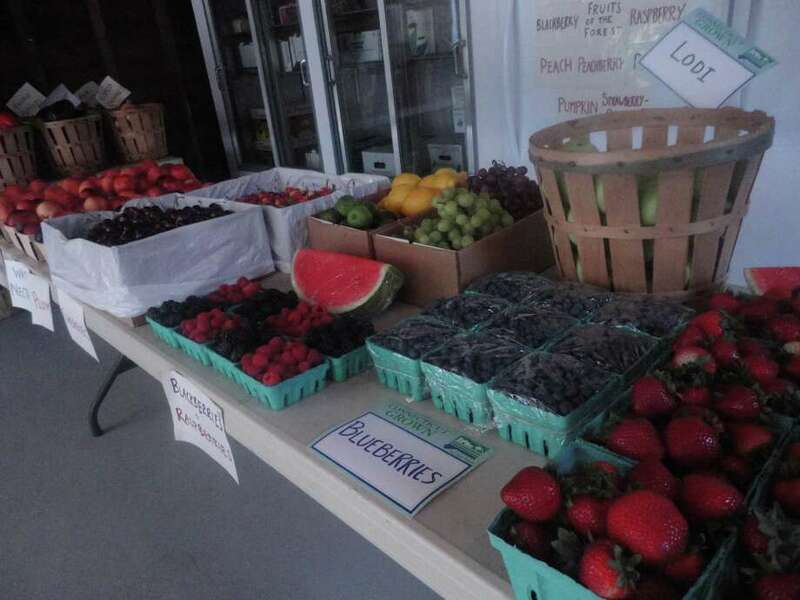 An array of fresh fruit, including locally grown berries, fill a table at the farm stand. In 1946, 5-year-old Robert Haydu started to help his grandfather maintain Greenfield Farms, which at that time was one of the several working farms in Fairfield. Now, at age 71, Haydu operates the farm, the last one in town to grow its own produce. The farm was established in 1903 by Robert Haydu's grandfather, Andrew Haydu, who had bought land on Congress Street and Hill Farm Road. The farmland was eventually passed on to Robert Haydu's father, Julius Haydu, who sold most of the land in 1973 to the Steinkraus family. "The house on the property and two acres were never sold. It's always been in my family since 1903," Haydu said. "The Steinkrauses were about to sell off the 21.7 acres to the same builders who had spun off two homes, but he was having trouble getting into the financing, and that's when the land acquisition came into being in the town of Fairfield." Today, Greenfield Farms is known as the only working farm left in Fairfield growing vegetables and corn, along with pumpkins and fall items, according to a Greenfield Farms flier. Its motto is, "Fairfield's Last Working Farm. Know Your Farmer. Know Your Food." "For farmers, land became too valuable and was sold off for development," Haydu said. "There's not a lot of money at all in farming, and what happened is that all the generations of farming either died off or they sold their land." The Great Depression after World War II put more than 25 million people out of a job and money, according to the flier. During the height of the Vietnam War in 1965, Haydu went to work for Remington Arms in Bridgeport, while continuing to help fund the farm. "The big peak of farming was the year the Second World War was starting, and the law that milk had to be pasteurized affected farmers," said Winnie Stickles Kent, 98, a longtime resident of Fairfield. "It was expensive, and why would a farmer work for pennies a day when he could go to a factory and do work for the war? The farmers couldn't get anyone, so they gave up farming." At the same time the farms started to disappear, there was also a constant need for more residential living over farms in Fairfield, according to Fairfield historian Bill Lee. Residents wanted there to be a reduced commercial factor for the wealthy area, he said. "Fairfield became very residential, and maintained this strict residential concept," he said. "They didn't want any farms or anything like that in the earliest part of the 20th Century." In the 1940s, Fairfield used to be 90 percent farmland, with seven dairy farms, Haydu said. Now, there seems to be "100th of 1 percent," he said. Haydu said that today's taxes in Fairfield are "just out of this world," especially on top of the cost of doing business. For farmers, the seed cost has tripled in the last 10 years, and the price for fertilizer has quadrupled, he said. "If I were a little younger, I would have been out of here in a second," he said. "And business is not what it used to be. People want their food almost prepared for them. I don't know if it's just a too busy of a lifestyle, or if people just became lazy. There's just so much fast-paced living." Greenfield Farms has eight acres of cultivated land at Congress Street, and another 22 acres of cultivated land at Haydu's Easton farm, where he grows most of his produce. Only three people help out with the produce stand on Congress Street, and Haydu does most of the plowing, planting, fertilization and cultivation and collecting himself. "He (Bob Haydu) has a lot of acreage," said Melanie Marks, an historic researcher and professional genealogist. "He is basically the last of the true farmers in Greenfield Hills." "We're the last called `working farm,' and it has been that way for quite a few years in Fairfield," Haydu said. "They have a farmers market around here Saturday mornings. There are farmers down there, but they are not local. You'll find that that's the case with any farmers market around here, because there are no farms around here." Haydu said that maintaining the farm is a "year-to-year type of thing," depending on his health. His goal, he said, is to keep on continuing the pumpkin festival for as long as he can. Haydu does not have any children, and when asked what will happen to the farm once he retires, Haydu replied, "I don't know."